We are very pleased to once again be able to offer a wide range of courses as part of the BA-certificate “Gender Studies” in summer semester 2019. A detailed list of all courses at the UzK in summer semester 2019 that can be taken and credited as part of the BA-certificate can be found here. 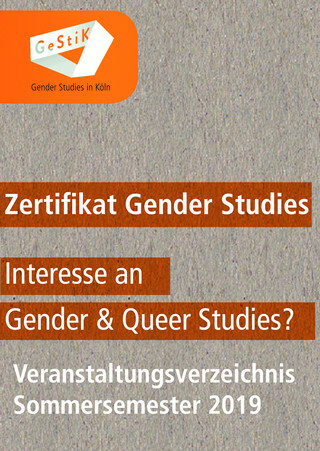 Since the summer semester of 2013, students at the University of Cologne have been able to acquire a Gender Studies certificate. As an additional qualification, this is a supplement to the specialist studies and certifies the acquisition of basic knowledge in the theories, concepts and methods of gender and queer studies. The certificate is anchored in the Studium Integrale (SI) as well as in the Extracurricular Programmes (EA). The courses offered include a large number of interdisciplinary seminars and lectures. The certificate can be started at any time and without separate registration. From the winter semester 2016/17 onwards, the Faculty of Applied Social Sciences of the TH Köln has been offering its Bachelor students the opportunity to obtain a gender certificate.